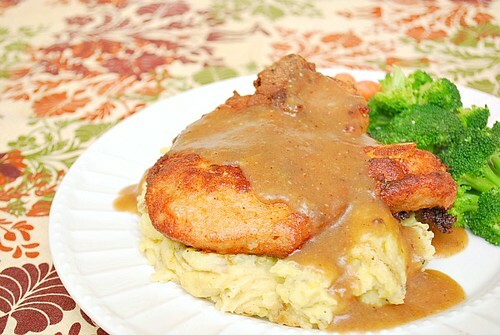 So in a typical, standard, gluten laden recipe, all purpose flour would be used to coat the pork chops before cooking and again in making the gravy. I still used flour but a gluten free flour blend which you can either purchase from the store or make yourself (which I recommend). Just by having a gluten free flour blend available in your pantry, you can easily adapt and substitute any all purpose flour called for in recipes. But I'm still learning about gluten free substitutions There are various ways to substitute and it isn't also a 1:1 ratio... like in baking for example. Thankfully, this recipe is a 1:1 ratio and using a gluten free flour blend is practically fail-proof. The original recipe didn't call for any flour but because I cooked the pork chops twice - once to brown on the stove top and again in the oven - the flour helped with the crisp texture and maintaining some moisture in the pork. In a small bowl, combine the Seasoning mix, 1 cup gluten free flour blend, salt and pepper, and whisk well. Liberally dredge the porkchops on both sides with the seasoned flour. Heat skillet over medium high heat and add oil. When hot, add a few pork chops to the skillet and brown on both sides. Repeat with remaining pork chops. Transfer browned pork chops to a parchment lined baking sheet and bake in preheated oven for 7-10 minutes or until the pork chop internal temperature reaches 160 degrees. With the oil left in skillet after all port chops have been browned,warm up over medium heat. Sprinkle the remaining 1 tablespoon flour into the pan, whisk in, then add additional salt and pepper to taste. Cook for 2 to 3 minutes. Add the hot chicken stock and cook uncovered for 4 to 5 minutes until thickened. Season, to taste, and serve. It's easy to prepare and I like the way they taste with the Hidden Valley mix. YUM, Joelen!!! 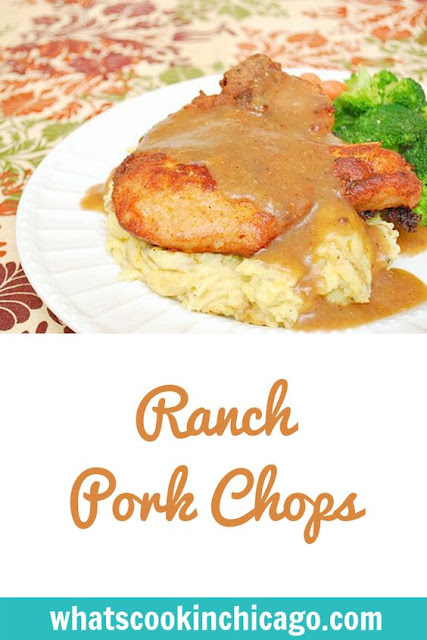 We love pork chops, always looking for a different way to prepare them.